Gaden, Tibet (China) -- One of Tibet’s most prominent monasteries, Gaden, was completely destroyed during the Chinese Cultural Revolution but has since re-established itself in India. JAMIE KHOO visits the new site. 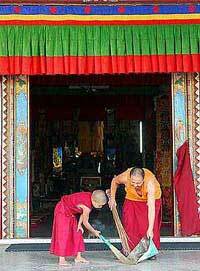 << The young and the old work together to contribute to the upkeep and growth of the monastery. Enlightenment does exist. And its temporary heaven on earth, under a scorching sun, is in a tiny village called Mundgod, in south India. One of 24 settlements given by the Indian government to Tibetan refugees when they escaped the Communist invasion in the 50s, Mundgod now flourishes with a profusion of maroon robes and the warm energy of monks. A group of 60 pilgrims from Kechara House in Malaysia recently visited the new Gaden Monastery there under the guidance of their spiritual director, Tsem Tulku Rinpoche. 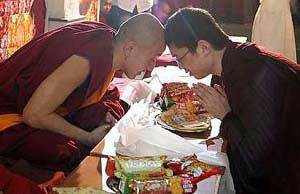 Having lived in Gaden himself, studying for many years under Tibetan Lamas like Kyabje Zong Rinpoche and Gashar Kensur Jetsun Jampa Yeshe, Tsem Rinpoche was making his first trip back in five years to present offerings to the 3,000 monks there. Kechara House, his Dharma centre here in Sunway Mas, is a branch of Gaden, and Tsem Rinpoche is the only representative of the monastery in Malaysia. The largest of a trio of monasteries in Mungold – including Sera Monastery and Drepung Monastery – Gaden traces its roots to Tibet where Lama Tsongkapa first established the original monastery in the 14th Century. Tsongkhapa is especially famous for a seven-year retreat, in which he completed 3½ million prostrations (as a practice to purify karma) and over one million mandala offerings. Taking inspiration from teachings of the three existing schools of Buddhism – Kagyu, Sakya and Nyingma – Tsongkhapa revived the Buddha’s teachings as they entered a period of degeneration, combining the best of the three schools and the teachings of Indian masters into the Gelug school. This school and its teachings has become increasingly widespread in recent years, touching cities all over the world, from Beijing to Los Angeles. Its particular emphasis on logic rather than mysticism, and the balance it strikes between meditation and study resonates strongly with spiritual seekers. The Buddhist way, with its emphasis on transforming the self, rather than others, does not particularly encourage people to go out and preach, and as such, Gaden’s profile continues to remain relatively low. When the Lamas escaped from Tibet to escape persecution during the Cultural Revolution, they left literally with just the clothes on their back. The Gaden of today was built from scratch. There is still a very long way to go in building it up to its former glory but the monks are unfazed. Ken Rinpoche explained, “Due to our own negative karma, we’ve lost our land. But we’ve managed to establish here – not just physically but also in essence, since the studies and learning are still the same. This perspective that it is “due to our own negative” karma is refreshing and almost surprising. How much more difficult it must be to blame ourselves than to point fingers. And yet, this is what allows the monks to cultivate such serenity in the face of adversity. In Gaden, you can sense this collective determination to get out of suffering, no matter how subtle. At the same time, its very walls are imbued with the stillness of being in the moment, of delighting in everything just as it is. Kechara House has just produced and released the first-ever documentary about Gaden Monastery – its history, lineage, and the recent pilgrimage that was made. # For more information, contact Kechara House at (603) 7806 4582 or e-mail kh_info@kechara.com.